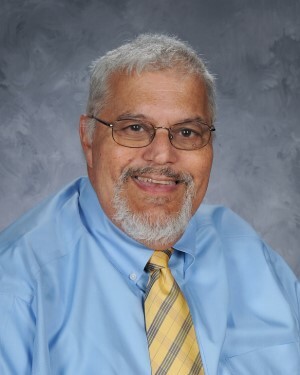 Joe DeAngelo had a positive impact on nearly every student who has ever walked the halls of Badin High School, and the school will not be the same without him. Badin High School is looking for a new head coach for its girls’ soccer program, and if the next hire is anything like the previous hire, it will be a home run. 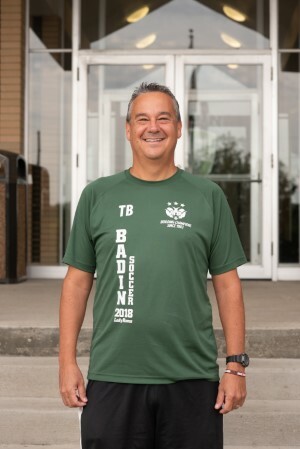 Todd Berkely met with his team Friday afternoon and announced that he would be stepping aside after six outstanding seasons guiding the Badin girls’ soccer program. 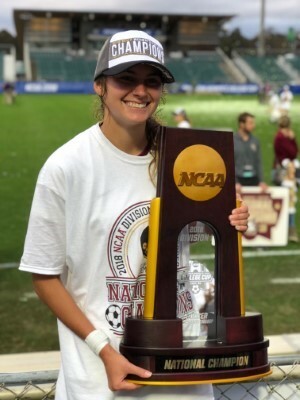 Those six seasons included two state championships, five district titles, a league title, and numerous players moving on to the college soccer ranks. “That was an extremely difficult meeting to have, because high school sports is all about the kids,” Berkely said. “But I know the girls’ soccer program will be in good hands moving forward because the Badin administration does a great job making sure they bring in the right people.” More about Coach Berkley's time at Badin HERE. Local employers are looking for reliable workers, and they know Badin students make great candidates! We now have a new page on our site for the posting of available employement oportunities, linked from the Students home page and also found HERE. Check it out! 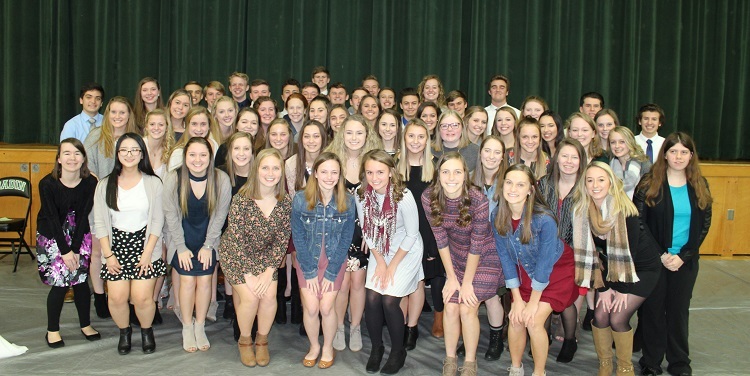 Badin High School inducted 58 students into its National Honor Society chapter during its annual evening ceremony on Tuesday, Nov. 27, in Badin’s Mulcahey Gym. “These students do an outstanding job in the classroom,” Badin High Principal Brian Pendergest said. 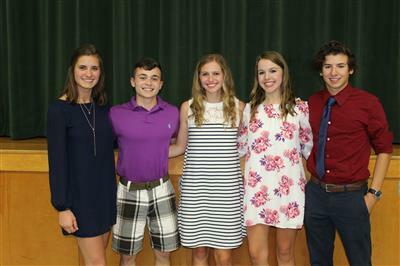 “But they are also very well-rounded, and their performance all across the board helps make Badin an outstanding place to go to school.” National Honor Society recognizes students who excel in academics, character, service and leadership. 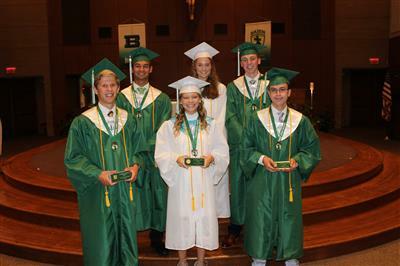 Tuesday’s event added 22 seniors and 36 juniors to Badin’s NHS chapter. 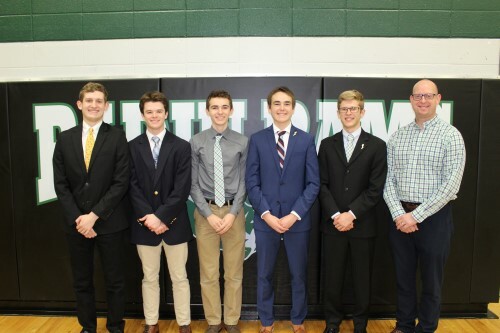 That brings the current National Honor Society membership at Badin to 98 students, with 40 members of the Class of 2019 being tapped last year. Congratulations to the following Art III, IV and AP students who have had their artwork juried into the 10th annual Xavier University Biennial Exhibition/Competition: Kellina Brannen, Chase Hopewell, Isabelle Munafo, Kaitlyn Robinson and Regan Runtz. The opening reception is Friday, November 2, 5-8 pm in the Xavier Gallery of the A.B. Cohen Building. The artworks will be on display through November 21. See artists' work HERE. 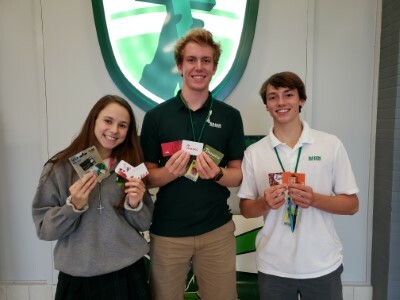 Badin collected over $850 in gift cards slated for the flood victims of St. Mark's Catholic Elementary in Wilmington, NC. Thanks to all who donated! Badin Art Studio received a grant from the Walter Family and the Cincinnati Zoo & Botanical Garden for their work creating two rain barrels which raised money for Save Local Waters. 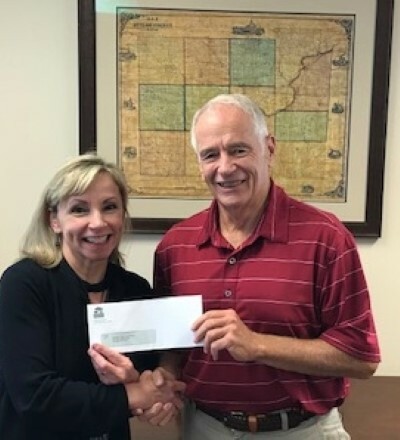 Art teacher Mrs. Sara Daniels was honored to receive the grant from '71 Badin graduate Greg Wilkens and his staff who are committed to saving local waters. David Gretz has seen the technology program go from zero-to-60 during his tenure at Badin High School, and he has been in the driver’s seat for all of it. 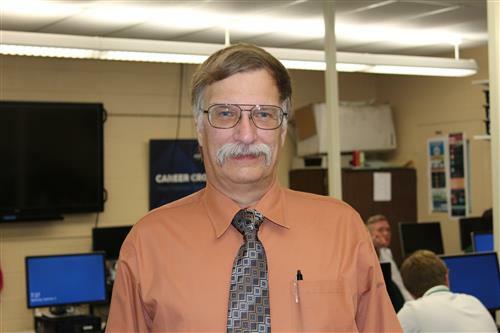 Gretz, now in his 18 th year teaching technology at Badin, is the school’s Educator of the Year recipient in the annual Harry T. Wilks “Hamilton Celebrates Education” awards event for 2018. “It is extremely rewarding and gratifying to work with the people I work with and teach the students I teach,” Gretz said. “They are enthusiastic learners and I’m really lucky to teach students who see technology as important in their lives.” Read more HERE. 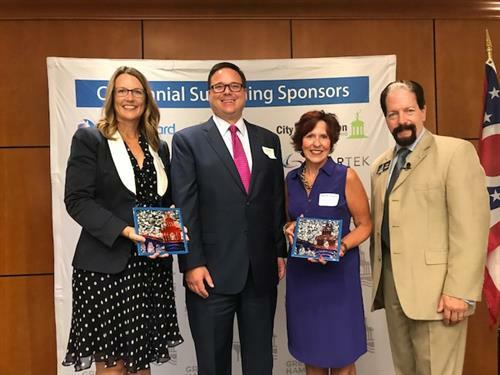 Cynamon Trokhan (Badin board member) - Hamilton Heritage Award and Kym McCaughey ‘79 - Small Business Person of the Year Award, were recently recognized by the Greater Hamilton Chamber of Commerce for their impact in the Hamilton area. 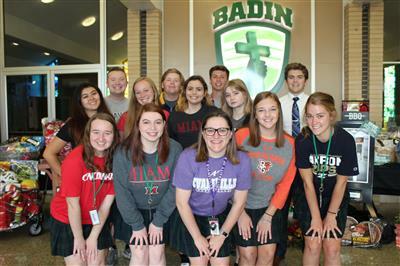 Badin High School will graduate 117 seniors during its annual commencement exercises on Friday, June 1, at St. Maximilian Kolbe Church in Liberty Township. “It’s been another excellent year and these students have a lot to be proud of,” said Badin High Principal Brian Pendergest. 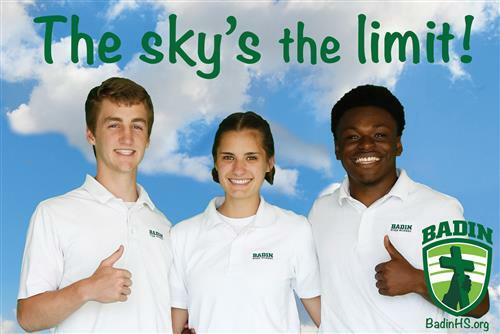 “This is the culmination of their experience at Badin High School, but the beginning of much success over the rest of their lives.” More info HERE. Valedictorians in Badin High School's Class of 2018 are Andrew Abata and Jacob Waggoner. Abata will attend Miami University and major in Biochemistry as a pre-med degree. Waggoner will attend the University of Alabama and major in Management Information Systems. 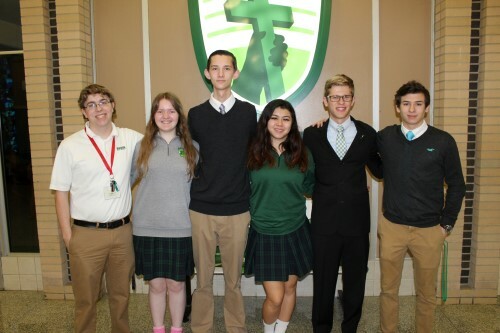 They will be among the student speakers at Badin's graduation on Friday, June 1, at St. Maximilian Kolbe Church in Liberty Township. More award winners HERE. Among the major award winners among juniors at the annual Badin High School Academic Awards Night were, from left, Grace Larkin (George Washington Alumni book award), Cullen Gantenberg (Bausch and Lomb award for science), Emily Maher (Brown University book award), Allison Hammerle (Mayerson Foundation Service Learning book award), and Christopher Hetterich (University of Rochester Xerox Award for technology). 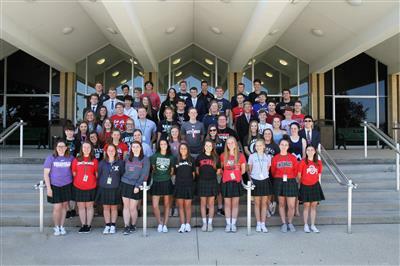 Badin High hosted its 12th annual Academic Signing ceremony on Wednesday, May 23, with 57 members of the Class of 2018 being part of the $100,000 Club -- they were offered $100,000 or more in academic scholarships for college. The 57 students will be attending 28 schools in six states. 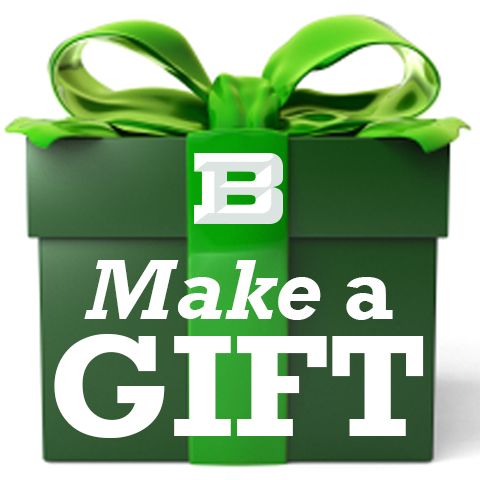 Badin's class of 117 seniors have been offered more than $21 million in academic scholarship dollars. More info HERE. 13 Badin seniors received Red Cords at graduation for having given blood at least three times during their high school career! 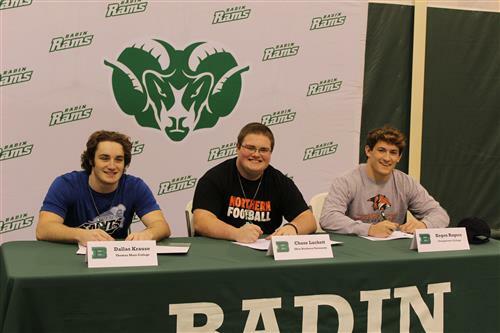 Six more Badin seniors signed to play college athletics on May 22, bringing the total for the Class of 2018 to 19. 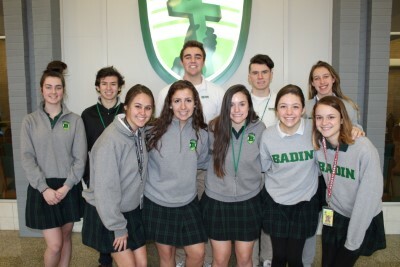 Six athletes are slated to be inducted into the Badin High School Athletic Hall of Fame on Saturday, May 12, in what should be another outstanding program, according to Dean Wright, chair of the school’s HOF committee. “These are not just outstanding athletes, but outstanding people, too,” Wright said. “It’s always an enjoyable and rewarding evening as we recognize the year’s recipients. They are proud of what they accomplished, and so are we.” More about the event HERE. 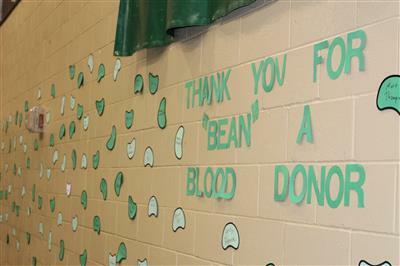 National Lima Bean Respect Day had a special meaning at Badin High School this year, since the date coincided with the school’s annual Blood Drive. Lima beans are a great source of protein and iron and offer good preparation for a healthy blood donation; and Badin’s drive on Friday, April 20, ultimately saw 86 blood donations from students, faculty and staff. More info HERE. "Meet.Serve.Grow." 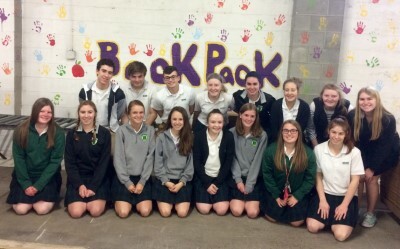 (Badin Service), met at Shared Harvest on April 23 to put together backpack bags for children in need. We have so much to learn about hunger in our community, and so much to give to make it better. Thanks to all Badin students who attended. If you couldn't make it this time, check for the next time we meet to make a difference. See Mrs. Halverson for more information.. 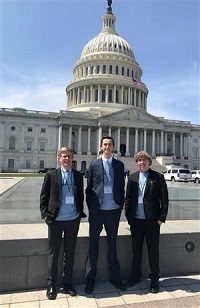 Seniors Nick Eyl, Jon Moran and Jacob Waggoner are in Washington DC this week for the 8th Congressional House of Code. The three of them were recognized by Congressman Warren Davidson in the fall for their winning app in the 8th Congressional District App Challenge..
2018-2019 School Calendar Published - click HERE for printable copy; or open School Events Calendar tab below. 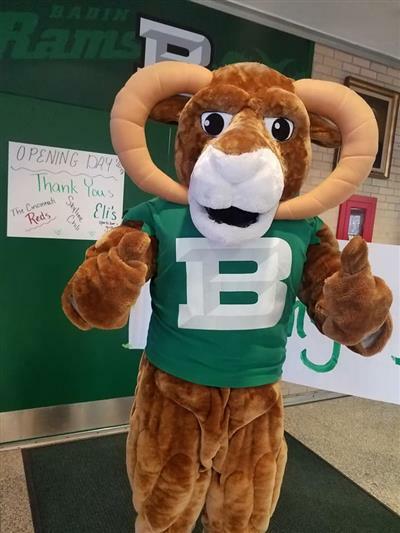 There will be a third member of the Badin High School guidance department starting this week … and she will belong to the whole school. 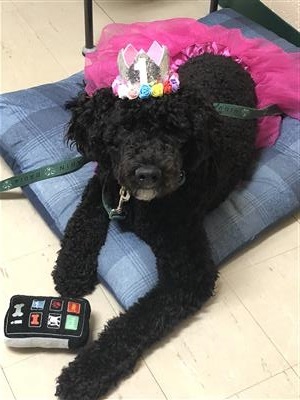 Rudy, a black multigenerational Australian labradoodle therapy dog, will be a welcome presence at Badin as she becomes a valuable member of the Badin Family. 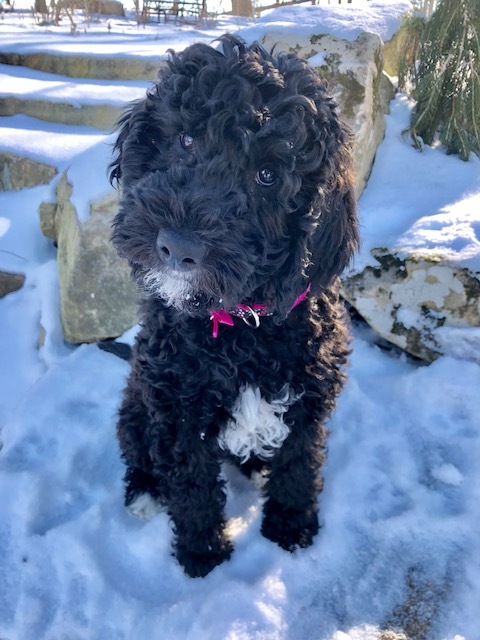 “We’re very excited,” said Badin guidance counselor Mrs. Angie Bucheit, whose family will provide a home for Rudy when she is not at Badin. "This is an innovative idea to meet the needs of the students." You can read all about Rudy HERE. Nine Badin High School students will be on the road in April for the annual DECA International Career Development Conference. The marketing education event is set for the Georgia World Congress Center in Atlanta from Saturday through Tuesday, April 21-24. More info about their trip HERE. Congratulations to senior Chloe Mallory, who is a finalist for the Anthony Munoz Straight A Scholarship! 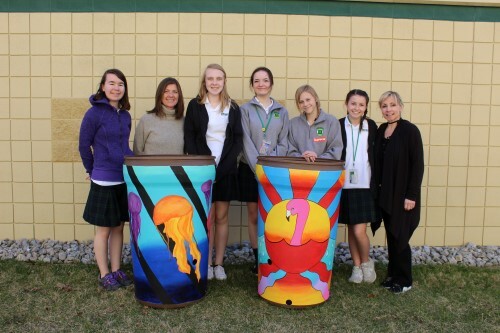 Badin Studio Artists who came together as a team to create these awesome Rain Barrels which will be exhibited at the Cincinnati Zoo April 1-19. The Rain Barrels will be auctioned online April 9-19 to raise funding for SAVELOCALWATERS! On April 19, there will be a "Party for the Planet;" the finale auction and artist's reception. An Ohio River Valley Rain Barrel Art Project: Saving Rain for a Sunny Day!. 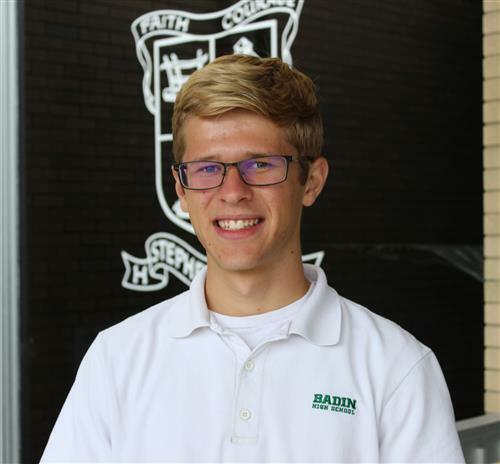 Badin High School senior Jacob Waggoner has been named a National Merit Scholarship finalist. 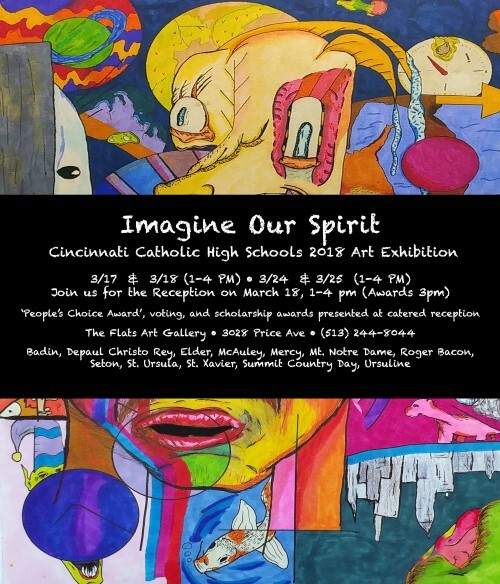 Congratulations to Badin Artists Regan Runtz, Sara Schneider, Jalon Smith, Will Stewart and Grace Tincher who had their work juried into the GCL (Greater Catholic League) "Imagine Our Spirit" Exhibit. 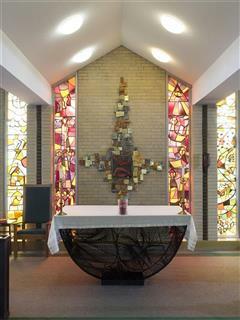 The exhibit will showcase student artwork from 12 Catholic High Schools. The opening reception is Sunday, March 18, 1-4 at the Flats Gallery. The Flats Gallery is located at 3028 Price Avenue in the Incline Arts District of East Price Hill. Full exhibition dates and hours are Sat 3/17 & Sun 3/18 (1-4 PM); Sat 3/24 & Sun 3/25 (1-4 PM). Badin has a 4x800 relay team in the state indoor track meet at the Spire Institute in Geneva. From left are Simon Hoppa, Aidan Drake, Andy Moore, Mike Rand, Jacob Waggoner and Coach Aaron Fleckenstein. 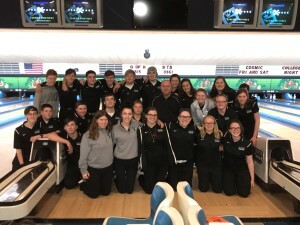 Senior bowlers Jared Berger and Stephanie O'Neil will represent Badin in the state bowling this weekend at Wayne Webb's Columbus Bowl. O'Neil is just the third girl and Berger the first boy to go to state for Badin! 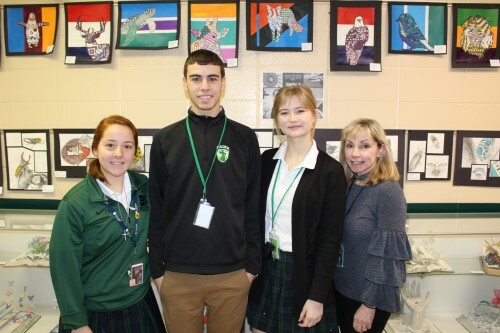 Congratulations to Badin High artists who received awards for their outstanding artwork in the Middletown Arts Center's annual "Tomorrow's Artists Today" competition. Senior Maddie Maccio received a second place in the drawing category, senior Will Stewart was second in the painting category, and senior Grace Barrington earned a first place in the paining category. They're here with art teacher Mrs. Sarah Daniels. Honorable mention nods went to juniors Chelsea Andorn and Isabelle Munafo in painting; senior Emma Wethington and sophomore Caitlin Savage in drawing; and sophomore Elizabeth Hurst in mixed-media. 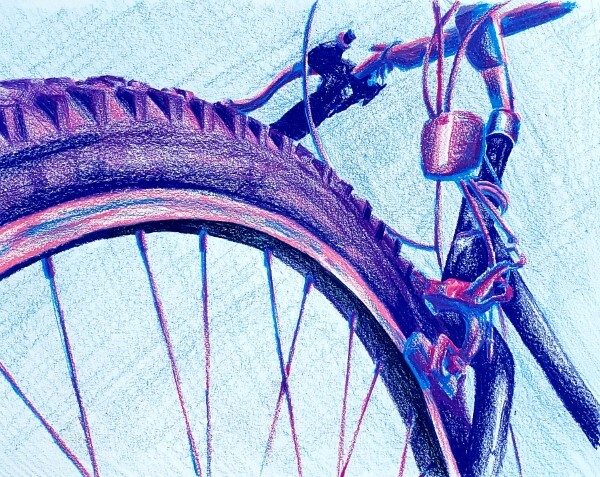 The students submitted excellent work for the competition, which will be shown through March 1,. 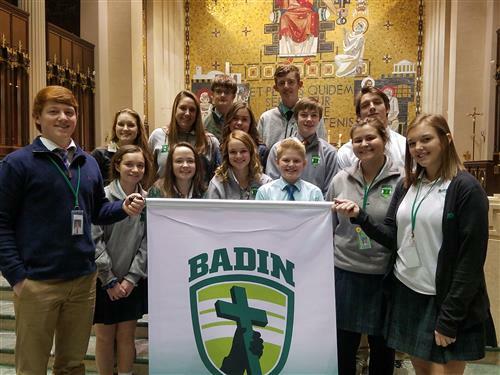 Badin High School will celebrate the 45th annual Catholic Schools Week beginning Jan. 29 as an opportunity to emphasize the value of Catholic education. 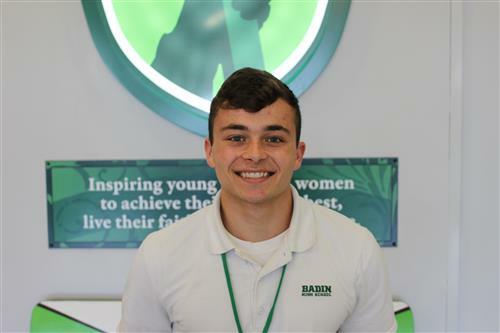 “This year’s theme of Learn, Serve, Lead and Succeed is one that we certainly encourage our students to take to heart,” Badin Principal Brian Pendergest said. “Those four words sum up the goals we have for our students. 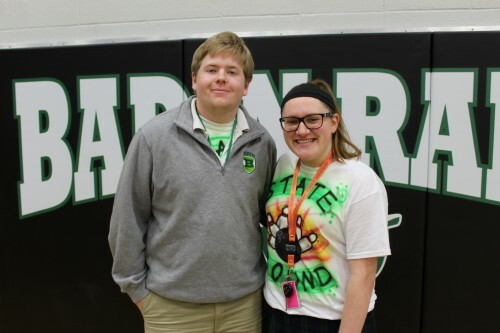 There is great value in being involved in Catholic education, and we appreciate the chance to celebrate that.” Read more about CSW activities at Badin, HERE. The Girls Bowling Team is undefeated so far this season and Claire Steins '18 bowled a high of 223 in the last game against Roger Bacon! Thanks Father Ed for stopping by the lanes to support the teams! 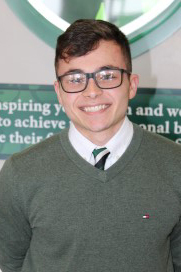 Congratulations to Badin High senior Andrew Noelker, who was awarded a San Damiano Scholarship to Marian University. 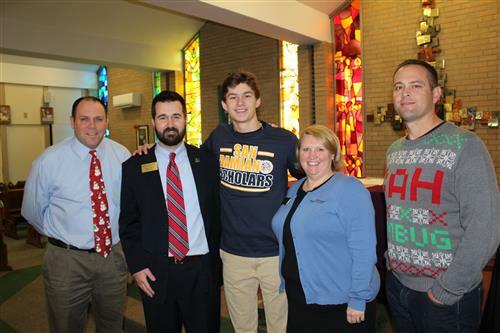 Noelker, who has already committed to play baseball at the Catholic school in Indianapolis, will now be a part of its faith-based leadership program through the prestigious San Damiano program. 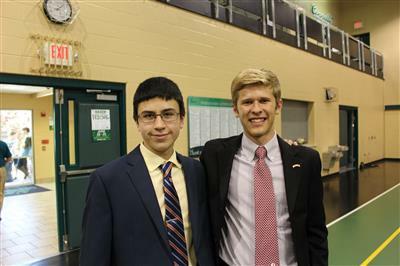 Three Badin High School seniors were recognized by U.S. Rep. Warren Davidson on Monday morning during a surprise technology assembly at the Catholic school in Hamilton. Nick Eyl, Jon Moran and Jacob Waggoner were honored for having won an 8th Congressional District contest to create a useful iPhone app. The Badin trio created a service app that gives users the chance to make a difference in their community through local service opportunities, through supporting local businesses, and also to get in direct contact with their local, state and federal elected government officials. Girls who excel in science, technology, engineering, arts and math, attended this morning's STEAM Breakfast at the YWCA Hamilton with Dr. Carolyn Mazloomi, renowned author, artist and engineer. Dr. Mazloomi shared her story of working as an aerospace engineer as a woman of color, and later, transitioning to a career in the arts. The STEAM Breakfast is one of many programs of the One City One Book community reading program in the city of Hamilton, and focuses on themes presented in the book, Hidden Figures.